August 30, 2001 Summer’s end is upon us, signalled by the whirling cicadas who’ve emerged from their seventeen year underground grublife only to mate and die. 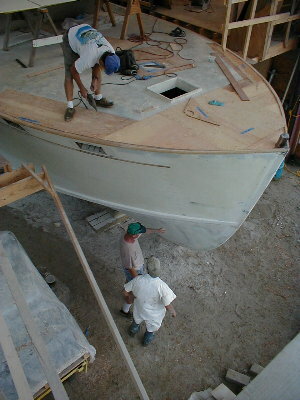 The Cherokee crew is busy as an octopus with all hands on deck, below deck, and everywhere in between. Speaking of the deck, Jeff Heyland has begun laying new decking in areas that are finished below. He also completed the new bumpers. The guys below finished the grueling task of sanding the microballoon layer on the bottom of the boat. 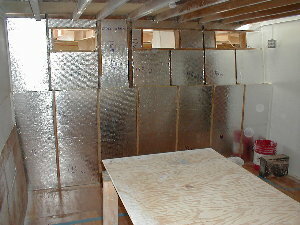 Norm and Jeanette cut and installed interior insulation in the aft cabin. 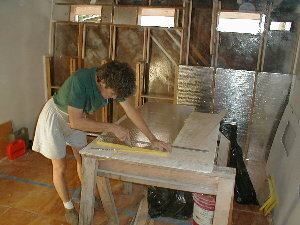 The insulation was fitted behind the wall panels, which were fabricated, sanded, and painted earlier. 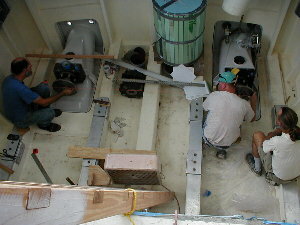 The waterjets have been installed temporarily – the port jet in the picture below has the reversing bucket in place. 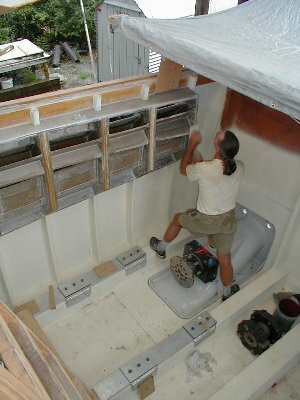 Jim and Bill are fitting the engine mounts and marking the bolt pattern for the permanent installation. Bill and Jim are shown below holding a mock-up profile of the engine with a new oil pan configuration. 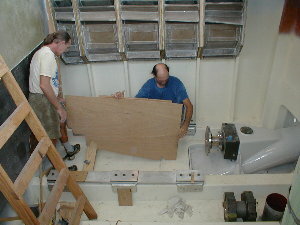 The photo on the right shows Bill and Leonard lining the two jets up on parallel center lines and measuring for the exact location of the motor mounts. 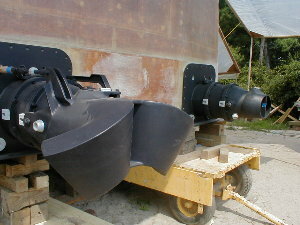 The round green object is a mock-up of one of the mufflers. 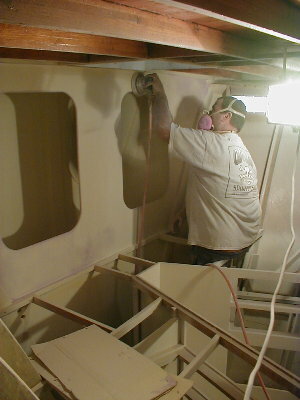 Jim finished sanding the surfaces of the noise-reducing engine intakes. 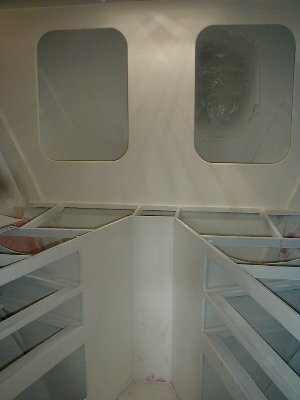 All the baffles are installed. Jim continues to prep for the final covering panel. Meet the latest member of the crew – Stewart Wild. He’s a first class sander, and boy has he has come to the right place. 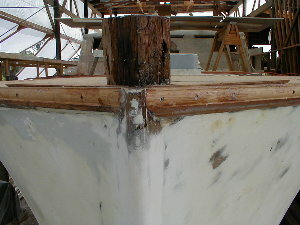 Here Stewart is shown sanding the V-berth.